Transference n. In psychoanalysis, the process by which emotions and desires originally associated with one person, such as a parent or sibling, are unconsciously shifted to another person, especially to the analyst. I've had a difficult time getting into the new Spoon album. I have juggled feelings of nostalgia with feelings of disappointment, and all the while have tried to find the places where the album becomes exceptional. Past Spoon albums, specifically Gimme Fiction and Ga Ga Ga Ga Ga took time to grow grow on me. They lacked the same pop-scientific accessibility of Girls Can Tell and Kill The Moonlight. Those two elder albums were perfectly crafted for the mid-20s, chaotic, confused growing human being. The sentiments were all truisms, and the sounds were all original, bombastic, honest, sparse and dynamic. While Spoon has grown those descriptors remained applicable, but in different ways. On Gimme Fiction we could all easily attach ourselves to "I Turn My Camera On" and "Sister Jack" because they were both "old" Spoon songs, the mixing was more expressive, the beat more powerful, but the design was recognizable, comforting. Only then could we latch onto the other songs "The Beast and Dragon, Adored" and "The Infinite Pet". Even with Ga Ga Ga Ga Ga we took time to grow with it. "Don't You Evah" and "You Got Yr. Cherry Bomb" were instant hits, but there were sleepers in "The Underdog" and "Don't Make Me A Target" (and personal favorite "My Little Japanese Cigarette Case"). The point of all this exposition is to illustrate how I have thought Spoon had lost it before, only to be blown away with time and careful mastication of the material. And that's what makes my feelings about Transference so hard to express. The newest album feels short and plain. It's not really shorter in time than any of the others, but it drifts by almost inconsequentially. "Got Nuffin" is the high-point of the album, the big lift, but it's only a single dropped into the latter half of the album. It feels, now, more like a reminder. As if Spoon is saying to listeners, "This is why you like Spoon." But why so late in the album, and why without back up. I hate, HATE to say it, but "Goodnight Laura" sounds like a Coldplay song that Spoon slightly remixed. And the rest of Transference just sort of flutters, never getting loud, never grabbing the ear with a lick or hook that was so reliably present in previous releases. It's like a penguin. The album has wings, we can see them, but all the flapping never yields flight. Instead Transference contentedly slides around on the ice, a smooth level feel that isn't bad, but isn't energizing. It's a departure for Spoon, and one I can't say I happy with. My friend Mary Kate, an avid, steadfast Spoon fan, even gave it a droll "Meh" as her only review. And as I talk more and more with fans and friends, we can't get over that feeling of meh. It's just not great. It's not bad, but it feels passionless. And then I did some reading, which compels me to refer to the definition printed up top. 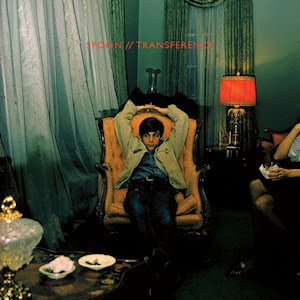 Transference is Spoon attributing some other relationship to music to its audience. The drive to create, the music, and maybe the sadness couched in this album are being thrust upon us through a sort of conscious-sub-consciousness. Spoon is not creating for us anymore. Not on this album, they are creating for something they used to feel that is now coming to us in a way that feels foreign. I had even said this afternoon that the album felt like an '80s art rock album. Quiet, still notably composed, but as if created entirely on Valium or some other sedative. If that is true, if my ears did not deceive me, then perhaps Transference feels different because we didn't expect these feelings, this style, to be thrust upon us. We are all analysts when it comes to music, and even if we don't break things down much beyond personal taste, we are constantly assessing our enjoyment and the music's value thereby. So, is this an intentional act (we must consider that if we're to attempt to ascertain success within this artwork-enjoyment or non-enjoyment does not constitute satisfaction)? I have to believe that Spoon knows what they've done. The lyrical complexity and narrative aptitude demonstrated on previous albums makes it impossible to believe this was just a case of the band firing blanks. Yes. It's conceptual. It's deeper. And in that way it works. And another wrinkle: we too, the audience are experiencing transference when we listen to this album. Our old association, the feelings we had for Spoon from 2001 - 2007, hold steady within us even though we (and the band) have grown up. Instead of enjoying the new way the band is on this album we're unhappy because we want them to be who they were when they either no longer are, or are turning purely for effect. But I still don't love Transference. Not yet. Perhaps I will. Perhaps I will listen to it with the right person, on the right night, in the right moment and it will gain the associations necessary to rank it among the greats. Maybe it will just grow on me. Could it be like an impressionist painting, and that I'm looking at it so closely that I can only see the dots, the brushstrokes, and I'm not letting myself see the complete picture? I will not stop listening to this album. It's a must play because in a way I want to conquer my discontent with it. And that's the difficulty of music appreciation. Many of us, reviewers, listeners, audiophiles, build a perception of a band and love that perception as much as the music they create that fulfills that perception. Then, when the band takes a right turn, when the music is no longer what we expect, we begin to question its value. For the sake of Transference, we have to surrender our expectations (those "emotions and desires originally associated with one [band]"). Spoon may be intentionally performing the same mistake. There's no way to be sure, but we have the power to keep open minds. And then we may see an old friend in a new light. A fun extra note: My review of Harper Phillips' Cartography has been quoted and linked in Boulder's Elephant Journal here! Exciting stuff! You can check out the Elephant Journal's great work on their website, and Harper Phillips' exceptional ukulele music on iTunes and at her bandpage.